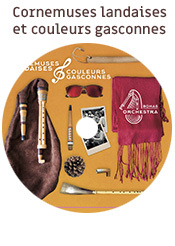 "Carnet des bal en Gascogne " is a collection of 95 musical sheets/scores accompanied by a CD, where all the melodies/tunes are played by the boha. The author's choice has been made by a repertory of ballroom dances, usually played or sung in Gascony and especially by the bohaires. You will find Scottish music, mazurkas, Circassian circles and other waltzes, but also other dances more specific to Gascony, like the rondeau and the congo. In order to simplify your discovery and use of this book, all the tunes have been classified by five different criteria : types of dance - popularity- technical difficulty (for a bohaire) - musical style- tunes in the public domain or composition. The aim of a soundtrack is to offer an intelligible interpretation by easily bringing out the tune while avoiding music that is flat and without character. Boha! At the heart of the Landes. An incredible history of the bagpipe from the Landes. Box set : 2 DVDs and a booklet. Discover or rediscover the boha, the bagpipe of the Landes of Gascony. The boha, the bagpipe of the Landes of Gascony, is an instrument of the emblematic music and culture and heritage of the Landes. It is true that it does not resemble the other bagpipes found in other regions in France. It is so original that when it came to give it a name in French, the ethnomusicologists chose the name of our area : «landaise » ! Its history, especially the revival of it being played, is rich, even though it has never been collected about. Despite the large scope of this project, in the first instance they decided to confine the revival to the Landes. DVD1 The documentary This first work is aimed at a wide range people interested in Gascony, its culture, its heritage, its music and its language - which also covers Occitan. It is subtitled in Gascon, English and Spanish. DVD2 : Treatise/convention of the bagpipe of the Landes. An innovative approach. An audiovisual teaching method. For further details search under heading/teaching Booklet : 36 pages quadri Completes/supplements the video documentary with texts and photos. Bohas Orchestra vous propose, avec cet album, un répertoire original, véritable invitation à chanter, danser et à nous retrouver autour de la musique. A l’occasion du 1erfestival international de cornemuses de SOUSTONS (40) en 2017, la «boha»ou cornemuse landaise a été mise en valeur, au travers des différentes animations. Autour d’un groupe déjà constitué, un nouveau projet est né : la conception de ce CD, destiné à valoriser la connaissance de la «boha». Ainsi, vous avez en main un emblème de notre patrimoine musical de Gascogne. Yan Cozian is a professor at the Conservatoire des Landes (Academy of Music), the transmission of the practice of the bagpipes of Gascony is his work. - To progress to a musician who has a bagpipe no teacher. - To a high of resume of teaching passages seen being. There are 220 songs and traditional music collected in the Landes from 1960 to the present day. This work is of interest to traditional musicians from Gascony and elsewhere. It is also for everyone who loves the culture and language of Gascony. It was of paramount importance for the author to give everyone the possibility to access the richness of our musical heritage, and to transmit it to our future generations. This has been achieved through this book, which brings together more than 200 melodies, songs or dances that had not previously been written down at the beginning of the 20th century by Felix Arnaudin. This work is of interest to traditional musicians from Gascony and elsewhere. It is also for everyone who loves the culture and language of Gascony. For the PassAires's first album the musicians decided to draw on their repertory for this record -Paraulas e musicas. They have created musical orchestrations and then arranged them to make the melodies, mainly collected in the 1970s to the 1990s, music that is current and dynamic, yet still deep traditional and acoustic. An audiovisual method of learning. An innovative approach The aim of this DVD is to simplify learning by explaining informatively with the help of short films/clips Yan, the boha teacher relies on his professional experience to create this original and innovative method. The second album of the group PassAires is eponymously titled de las hemnas, the women. You can hear the language of Gascony porte dancing, subtle rondeaux, swinging circles and languorous mazurkas. The album is made up of traditional songs and other compositions. Yan Cozian (bagpipe, clarin, vocals), Mathieu Dufau (flute, tambourine, vocals), Laurent Geoffroy (diatonic accordion), Simon Guillaumin (hurdy-gurdy, vocals) and Eric Oberlé (drums, voix). Cette méthode vous guidera pas à pas pour progresser dans la maîtrise de la boha et résoudre les difficultés liées à l’apprentissage. Elle est claire et concise. Après avoir enseigné plusieurs années dans le milieu associatif, Yan Cozian est devenu professeur de boha au conservatoire des Landes. La transmission de la pratique de la cornemuse landaise est son quotidien. Il a voulu partager avec vous son expérience, ses expériences de transmission. Elle s’appuie en partie sur la méthode audiovisuelle. Titre 1 : La prise en main de l’instrument. Chapitre 1 : A la découverte de la boha. Chapitre 2: La position de la poche et des bras. Titre 2 : Les premiers pas. Chapitre 7 : Les deux tuyaux de jeu. Chapitre 9 : Un arrêt net et précis. Chapitre 10 : Jeu avec le contra fermé. Titre 3 : Les ornementations et les modes. Chapitre 15 : Le piqué. Chapitre 16 : Les vibrés. Titre 4 : Le jeu de contra. Chapitre 19 : Le jeu de contra : présentation. Chapitre 22: Jeu de contra sur 2 mesures - Chapitre 23 : Jeu de contra à la mesure. Chapitre 24 : jeu de contra à la pulsation. Chapitre 25 : Jeu de contra à la sous pulsation. Titre 5 : Pour aller plus loin. Chapitre 30 : Jeu de contra et sensible. Chapitre 31 : Les variations. Chapitre 32 : Les modes. Chapitre 33 : La danse. Chapitre 34 : Polyphonies « landaises ». Chapitre 35 : Accorder sa cornemuse. Chapitre 36 : L’entretien de votre boha.